primary and junior schools. Children use light weight clubs and balls, as well as other eye-catching equipment, all of which I bring with me to tri-golf sessions. I currently teach tri-golf within PE lessons and after school clubs at a rate of £30 per hour. I have taught at over 20 local schools. Tri-golf can take place on school fields or in school halls. Spring and Summer Terms get booked up very quickly so please contact me as early as possible for avilability. 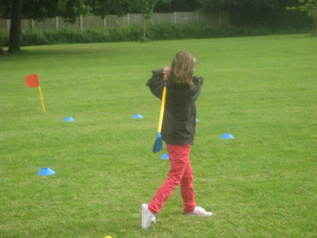 I also run the inter-school tri-golf festival at Nunnery Wood and Worcester Golf Range. I have an enhanced CRB check and safeguarding children certificate.